February market stats were published by the NWMLS yesterday. Before we get into our monthly stats, here’s a quick look at their press release. 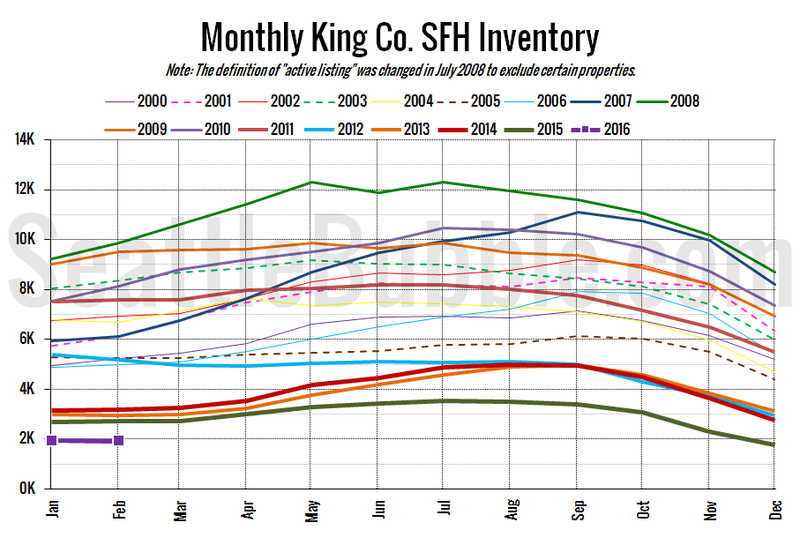 Home prices in King County hit new highs in February as buyers tried to outbid each other for the sparse inventory in much of Western Washington. “We’re in for another crazy spring real estate market,” predicts J. Lennox Scott, chairman and CEO of John L. Scott, Inc.
Whoa, calm down there, Lennox. Try not to get too excited. Wipe a little bit of that froth away from your mouth. Scott described current activity as a “Pac-Man” market – “Houses are being gobbled up as soon as they come on the market,” he stated. Today I learned: J. Lennox Scott has apparently never actually played Pac-Man. Last month we saw a slight uptick in inventory, but this month the number of homes on the market fell back down a bit again, putting us at the lowest February inventory level on record. With just 2,101 new listings hitting the market last month, February 2016 also saw the fewest new listings on record for a February, just barely beating out the previous low set in 2014. Basically, if you’re buying a home in the Seattle area right now, expect to have very little selection and lots of strong competition. Not a fun time to be a home buyer. 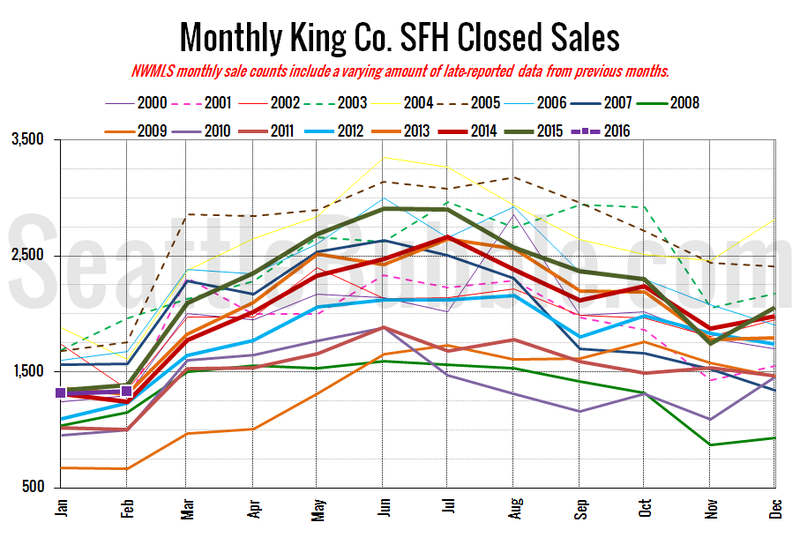 Closed sales were up just slightly from January to February, and down slightly from a year ago. Small comfort to buyers, given the scarcity of listings. It looks like the softening in the sales stats we saw in January was apparently just a blip, rather than the start of a trend. Total inventory is at its lowest February level on record. New listings increased slightly from January, but there were fewer new listings than pending sales, so don’t expect to see inventory increase any time soon. Both the red demand line and the blue supply line dropped in February. The demand side of the chart is just barely in buyer’s territory, but the supply side is so far on the seller’s side that the market is still strongly skewed toward sellers. Year-over-year price growth shot up from +11.2 percent in January to +19.8 percent in February. That is the largest year-over-year increase we’ve seen in the single-family median home price since the peak gain of +20.0 percent in October 2005. The median home price blew out of the $480,000 to $500,000 range it oscillated between for most of last year with a strong new high point in February. Check back tomorrow for the full reporting roundup. 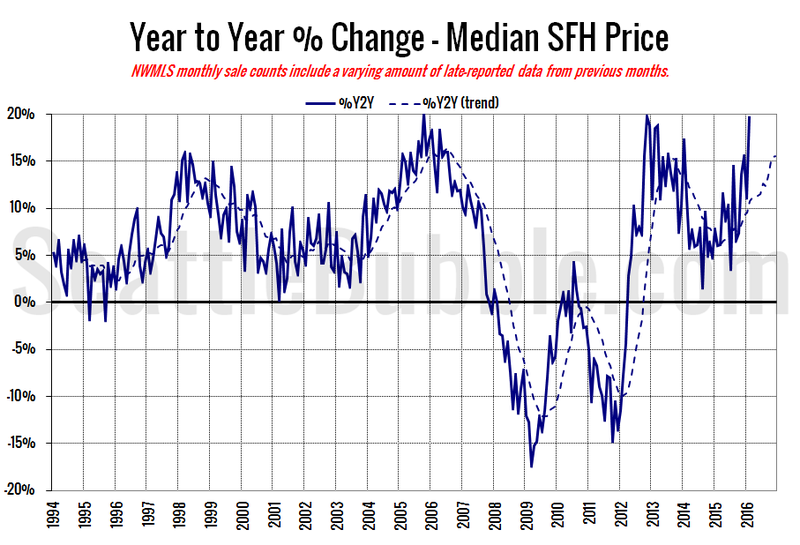 Case-Shiller: No Winter Price Dip For You! We are slowly becoming SF Bay area. all the housing policies are kind of similar too. ESS @#246: I too have been amazed by the amount of open but reserved space in the Bay Area. With a daughter in the area who has complained about housing costs and looking for clues re: the course of the Seattle market I’ve been paying attention for some time now. 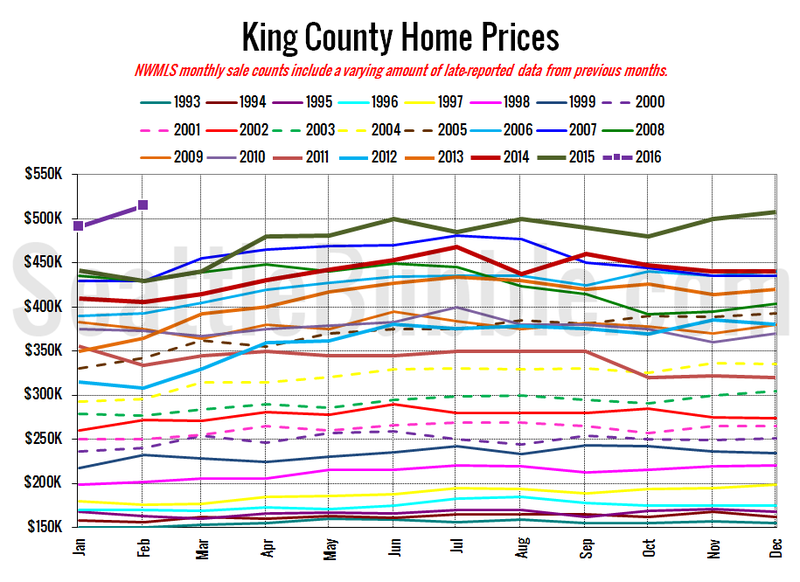 As you suggest there are several potential (and indeed likely) causes for the ever rising prices, many of which are also seen in the Seattle and surrounding markets. The blog comments, etc. are essentially the same conversation we have here. I’ve followed the San Jose market for over a decade- first because I had customers in the area and then because of my daughter’s involvement. It has, so far, always managed to go higher than anyone ever thought was reasonable or even possible. Today $750K buys less than 1,000′ on a 3,500′ lot in the most run down parts of the city, and it is likely a fixer at that. How odd to see what is essentially a shack prettied up over the years with an $80k Audi Q7 in the drive. Seattle is just coming on and still has a ton of upside potential, probably well beyond what most consider reasonable… or even possible…. The only thing I fear for Seattle as a market/investment opportunity is a major calamity on the national or world political stage. And I still believe that eventually excessive national/corporate/private debt and currency devaluation will get us, but until then the party continues. Feeling solid for the next couple years at least. Five more would be nice. 1. Invent time machine; travel back to 1992 and buy as much Seattle real estate as you can afford. I’m in Eugene, OR tonight and I just had dinner with two people who both own and manage multiple rental properties in this area. They both got started several years ago when you could buy houses for much less (one of the guys got houses for FREE from the city, but he had to pay to move them onto lots that he already owned nearby). Interesting analysis and information Scotsman. I like the image of a dump with an expensive ride parked in the driveway. Of course there have been calamitous events all along, but here we are today with high real estate prices. So short of all out total destructive war – we should be OK.
From your experiences in that market, is there talk of Bay area residents cashing out and relocating to less expensive housing areas? Do Bay area residents look upon the Puget Sound area as a possible destination, or are our wet winters a deterrent? If I had a house worth millions of dollars, I would certainly consider moving elsewhere so that I could free up some of that equity. Five more years? Hope so. By then we may liquidate our holdings here and relocate to a more affordable place ourselves. Will not consider the Bay area thought!! Seattle real estate story makes national media!! I had been to the Bay area numerous times, but I have never observed it from above. Flying over the Bay area on an airplane trip gave me a much different perspective than observing the view from the freeway. I was struck by the appearance of so much open space in the Bay area, so much so that I mentioned it to my wife how empty the area looked from above. I later viewed a map of the area and discovered a tremendous amount of land reserves and parks. Much more open space than what we have here in the greater Puget Sound area. I lived in the Bay Area for a year and all that preserved open space was one of the things I really liked about the area. The rub is it really hasn’t stopped sprawl; it’s just made it leapfrog past the open space. And the pity is the attempts to ban by law both new sprawl and new density, in the face of increasing jobs and population, have caused the price consequences we see now in the Bay Area. Thankfully, our land use planning is better here. In the Bay Area, it’s basically all done at the local level, so what you get is a bunch of cities and towns all saying “That’s right, we need more density. But it would change the character of our town if we did that. So someone else should allow it, but not us.” Here we have state laws like the Growth Management Act that require local governments to plan for and allow more housing. Whether it will prove up to that task remains to be seen. We’ll all be filthy, stinking rich!!!!! If you had a time machine to get you back to 1992, why not by $30k worth of microsoft instead of a house? Put in a buy order at $2.25 (split adjusted), and then when it hit $45 (split adjusted) in June ’99 sell it all for $600k and roll it into SBUX at $3 (split adjusted) per share. When that hit $60 recently it would be $12 million now, plus the dividends you would have gotten along the way, with no yard work or other maintenance! Hey, you’ve got the time machine! Why not use it to better advantage than just buying a house? I think the verdict is still out on Washington State’s Urban Growth Management Act. It will be interesting to see if it is really effective, or a way to have real estate increase in price by creating artificial shortages. I had mentioned a few articles back that the value of the land compared to the value of the house has really changed over the past few decades in Puget Sound. Unless the house is really huge and not in the urban Puget Sound area, a large percentage of the price is applied to the dirt. But it is interesting to note that all human building in the United States occupies about 5% of the land mass. The vast majority of land is agricultural, forest, deserts and parks. We may have urban sprawl in some cities, but we aren’t running out of space, even with the vast increase of population due to all types of immigration. Apparently the introduction of the open space concept in the Bay area made for more expensive housing. Thus it benefits the rich who can reside in their own houses and have access to that open space, while the poor have to double and triple up in a single family house. It isn’t the first time government policies have led to unanticipated consequences. Of course the implementation of density in this area is another issue that affects the wealthy and moderate single family homeowners in different ways. It is always the area of moderate homes that bears the brunt of density and mixed use apartment/condos in single family areas that predominate the suburban Seattle area. I have yet to observe high density, mix use, “affordable housing” appearing in wealthy or Puget Sound view neighborhoods, although residents of those areas think it is a great idea. It would be a pleasant surprise to observe mix use development spread evenly about those towns, but money talks, and it isn’t going to shut up any time soon. I was thinking something similar. I’d like to get 9 more years myself, but that may be pushing it. We are good for 2 years for sure. It would be smart to sell in 5 though to be safe. Interested in the opinions here. I currently own a 5 acre property in Skagit County. Not sure what it should sell for, but somewhere in the $450-525k range. My job is moving me to the east side of Lake Washington area, and the commute is simply too long to consider just staying in my current house. With traffic it’s 1.5 hours in the early morning, 2-3 hours in the afternoon/evening. While I may get something of a raise with the transfer it won’t be much, maybe 10% tops. I’ll get a relo package that will let me capture essentially 100% of my nominal equity. We’ve been looking on Redfin and the cost for a comparable house that is close enough to be sensible for the commute is totally unaffordable ($650k-$1.5mil depending on location, most are $700-850k). Even houses on typical suburban lots that are similar in sqft to our current house are quite a bit more expensive than what we’d sell for. One thought I had was to buy as small of a house as we can stand, something in the $350-400k range, (boggles my mind that a 1600sf house on 4000sf lot can cost that much), and try to pile up cash for the next few years and then buy what we want when my income will also have gone up another 30-40%. But I don’t want to get stuck with that house collapsing to $250k (or less) after that few years as that would destroy my ability to move up. Another option is to rent and hope for the bubble to burst. We looked at buying land and building, but clearing, site prep, septic, etc along with all the permitting and it would not only take forever just to get the permits to be allowed to start working on the lot, but would probably cost $100-200k more than buying an existing comparable house in the same area. Perfectly willing to look up around Snohomish or Monroe, east to Duvall/Carnation, and similar. I just wonder how much longer prices can/will climb at >10% annually, and when they stop climbing if they’ll just level off, or drop rapidly like they did in 2007. Hi the Tim. I am wondering how the number of comments and or page views at your site correlate to Seattle real estate market conditions. Maybe something like the economist’s Big Mac index, but not. Also, I would hold out on giving us a new post until more people become members. Kinda like NPR, but not. RE: Kary L. Krismer @ 26 – This is a good point. And, if you look at construction starts in King County, more than 70% is multi-family/apartments. In Seattle, if I recall, that number is approaching 80%. This is, significantly, due to VERY REGRESSIVE city zoning limitations. Point being: most of the building being done is counter to SFH. Which will only drive the prices up. PS: If anyone thinks Seattle is REMOTELY close to a bubble, just consider SF. The median house price in SF is ~$1.2M. Seattle is just over $520K. So, it would have to more than double, nearly triple, to reach this level. Yet, King County is the fastest (or one of the fastest) growing counties in the country. And Seattle’s income levels are quickly approaching SFs. There are just more people there. The combination of blue collar industry with the tech influx, and all the services that support this discretionary income, are going to make things hotter. I have 2 rehab houses that I bought in the fall and was fully planning to sell this spring. The market has become so ridiculous that I’m just going to hold onto them and rent them out for a few years, and see where I sit. Am I gambling by not taking the guaranteed profit right now? Sure. HOWEVER… the upside potential is FAR greater than the downside risk. Wouldn’t do it with my life savings. But housing, in King county, especially the city of Seattle, is about as safe a bet as real estate will ever be. People will ALWAYS need a place to live, especially starter/affordable/mid-level housing. And Seattle simply isn’t creating more/enough of it. And the government is actually hindering it. Pretty darn good combination for an owner. TERRIBLE scenario for a renter in a market with no rent control. That last link is the inaugural thread of this blog. With a little jumping around in time, you might find some approximate answer to your question about correlation between comment counts and HPI values. But I agree that it would be interesting to see graphs of the number of threads, comments and even page views as a function of time. But as you say, this is additional work for The Tim, plus page views might be considered sensitive information ;). My personal wishlist would be getting up/dn votes on comments, but presumably that would require using formal logins with passwords, which Tim perhaps is trying to avoid, for all I know. I posted a reply to your question, but it is in moderation because it contains some links. I will try to give you the gist of my answer without any explicit links: You can see threads from a given year/month via the URL thisdomain/blog/YEAR/MONTH (use numerical values with 4 and 2 digits), and some variations thereof. That might help you get an idea about comment counts over time. RE: Azucar @ 258 – You are 100% correct that it would have been much easier to buy Microsoft stock instead, but I was responding to a question about how to make money in local real estate. Close. It is the open space concept plus restrictions on increased density in existing residential areas. Some cities? There is an sea of sprawl in virtually all US metropolitan areas. Sprawl that cuts off choice of those living in it from getting around via any other way other than the personal automobile on congested roads. And roads will be congested in any major metropolitan area. Even Houston, which for decades had a very politically friendly culture for building more roads, ended up with badly congested traffic. Personal vehicles simply don’t scale well as a transport strategy. They work fine in rural areas and OK in small cities, but not in large urban areas. That’s completely aside from per-capita energy use and ecological sustainability issues. The issue here is not how much un-urbanized space there is; it is that the urbanized space tends to be dysfunctional to the point that even escaping the city for the weekend means fighting traffic to get out of the sprawl zone. Postwar suburbia, which was sold as a way to allow people to live closer to rural areas, has perversely made it more difficult to access and enjoy them. RE: David B. @ 269 – people can whine and complain about the government all they want but in the end the government a lot of times does what the people want. People don’t want high rises and increased density. they want their neighborhood kept exactly as it was when they moved. government simply does what the people want rather than any imperfect do-gooding. This is why I consider cities of 150K -250K people with metropolitan areas of half a million to be the best size place to reside in. They are small enough that one can travel about by car, but big enough to provide goods and services, health care and cultural options. Interestingly, I believe Houston is in the top five of populated cities in the US. It gained population really fast, and thus have massive traffic headaches. Wow this thread has a lot of information. Going back to the topic at hand, the market is out of historical alignment due to the lack of construction, (2007 crash hurt builders) and increased demand (local population aka job market has grown above historical average over the last 10 years or so). Graphs making the point and showing history here. Good old fashioned supply and demand answer the housing price question. The monetary discussion is just gravy. Unfortunately, not even one of the major players crashing, (Amazon, Microsoft, Boeing, Google, etc.) can kill this local housing hydra. Also, I did not include the very obvious influence of population growth on demand for Seattle housing in a previous post. Here are the stats on that. Enjoyed your wa/gov. According to that report, King County population increased about 121,000 from 2010 to 2015. Over the same period single family houses increased about 12,000 and multi-family units increased about 31,000. If average households are still about 2.4 people; households were increasing faster than total housing units, and there were only enough added SFR’s to satisfy 24% of the marginal increase in households. In Seattle proper, population growth was about 54,000 while SFR’s increased by 1,000 and multifamily units by 23,000. Overall housing growth seems in balance, but SFR’s were increasing at less than 5% of growth in households. My conclusion is that while I don’t know the future, this trend is not your friend. RE: whatsmyname @ 274 – depends on whether you own already or not. RE: Chuck @ 2 – RE: Chuck @ 2 – my theory for low inventory is “California effect”. Essentially, CA housing has reached to the point that most people will think 10 times before moving in there. Previously tons of people used to move from Seattle area to CA due to better jobs, money and weather. Now that whole pipeline is clogged. On the other hand CA companies are opening/expanding shop in this area en-mass so job market is great. RE: Ardell DellaLoggia @ 20 – your comments are very insightful however I assume tons of people are successfully selling existing house and buying new one in Washington without having extraordinary income. How do people here normally do it? RE: Kyle @ 41 – RE: Kyle @ 41 – How do you search for “off market” house ? RE: TJ98370 @ 73 – RE: TJ98370 @ 73 – Bidding wars with urgency happen because of two reasons (1) majority of buyers have had already made multiple offers in past without success. With each failure urgency increases. (2) Foreign buyers and investors like Blackrock typically aren’t interested in squeezing out last dollar in pricing. They will happily tolerate 10-20% above asking if that closes the deal immediately. Bernie smashes Hillary in WA state! Patty Sneakers, the Lovely Maria and Governor Sluggo better get on board and change their super delegate positions. Go Bernie! The Banque Royale Bubble, more commonly known by the misnomer “the Mississippi Bubble” (MB), started 300 years ago this year, in 1716. It was a scheme by expatriate Scotsman John Law to reduce the cost of financing (debt) for newly crowned King Philippe d’Orléans by creating a central bank. The “Mississippi” moniker came form the Mississippi Company (MC), which was France’s colonial corporate vehicle that owned all the French land claims and trading rights in the recently discovered North America. The article, by Edward Chancellor, is rife with obvious analogies to the 1982-2016 (so far) serial bubbles. Once it gets to the point where it makes an area as unaffordable as, say San Francisco, I would characterize it as a bug, not a feature. Moreover, what you defend can easily be characterized as “do gooding” as well: do-gooding by the people who want to tell their neighbors that they can’t, say, turn their basement into an MIL apartment . I first ran across the book many years ago. With a title like that I had to investigate. The first chapter is about John Law and “The Mississippi Scheme”. The second and third chapters are entitled “The South Sea Bubble” and the ever famous “The Tulipomania”. I believe Mr. Mackay was the first to write about such from the perspective of crowd psychology and his observations appear to be relevant to this day. The book also includes several more chapters about alchemy, fortune telling, witch hunting, etc. I found the book to be instructive and a fun read. Thanks, TJ. Lest we forget there was another very famous Schiller long before Robert Shiller. Hehe. By the way, I am sitting here with Edward Chancellor’s book on the history of financial speculation, “Devil Take the Hindmost” from 1999. A very good read. Also in my library is the book by Charles Kindleberger (very good) and the one by Nouriel Roubini (ok but not great). I should look into adding the Mckay book to my collection as well. I personally think reading the third chapter of Extraordinary Popular Delusions , “The Tulipomania” is well worth anyone’s time as a historical perspective. It’s only eight-nine pages long. A Wikipedia blurb on the Tulip Mania thing………. The Dutch tulip mania was referenced as an example as to how things can go wrong in many media articles during the most recent real estate bubble ending in 2008. Went to four open houses this weekend – one near my residence, three in Seattle. There were so many people attending these open houses that if there were any more prospective buyers, they would have to visit in shifts. The real estate agents appeared to be relaxed, informing the prospective buyers what date they were going to be viewing offers. The prospective buyers appeared to be stressed out by all the competition and the knowledge that much of what they were looking at would be in a bidding war. I would not want to be a buyer in this environment – too stressful. Me – I attend open houses to both keep an eye on what is going on in my neighborhood, and to discover ideas for the two rental houses we own. One can view what worked and what didn’t, and I have gleaned some really good ideas to resolve particular remodeling issues I have confronted over the years, as well as changes I am planning to make. Lots of good ideas out there! And most interesting, the house for sale near my house attracted an individual who got out of his British Columbian licensed automobile to enter the house for a look. Did my Canadian in laws finally listen to me when I have asked them to share some of their buyers in our area, as we have less expensive housing and the same great summers and lousy winters as Vancouver? I hope so! Anyone out there in Seattle Bubble land know of Vancouverites coming to the Seattle area to buy a few homes? RE: Justme @ 283 – It was “Manias, Panics, and Crashes” that convinced me to sell my house in 2006 and rent until 2011. It is the Bubble Bible as far as I am concerned. I am very grateful for the late Charles Kindleberger and his works. You have to become a member. Everyone else has been seeing fresh material. This article came from Ohio….the land of cheap? rent? “…An interesting array of ‘answers’ from people who aren’t landlords! Here’s my formula…there are others for sure….First, I have 15 questions that have to be answered before I even show a property. Some of those answers are used to verify truthfulness when compared to the background/credit/employment/criminal/judgements check that the prospective tenant(s) pay for with the application if they make it to that point. Those answers are scored and weighted as well. After that: Rule of thumb is 3 to 3.5 times income to rental. If it’s two or three unmarried people…remember, if one takes off, can the left behind cover the rent? That’s clearly unconnected to any FICO number. He assumes more than one tenant will be needed to afford the rent in Seattle…and he’s right. When you live like that you may end up like my daughter’s old friend. Being stuck with the whole $1500/mo bill when friends leave. Did anyone say no money for food? Awwww…mom and dad will bail you out or you can move back in with them…assuming they aren’t in horrifying low income debt too and most are. Those tenants are not non-existent. I just rented out a small SFH near Greenlake. Used Craigslist to market it, and received over 25 inquiries in the first 4 hours (pulled the ad after that). Had 5+ applications, mostly families, and all with a combined income of well over $120K (at least that’s what it said on the applications, only verified the final applicant). Prior to that, the house was being rented by a single professional with an income over $200K. 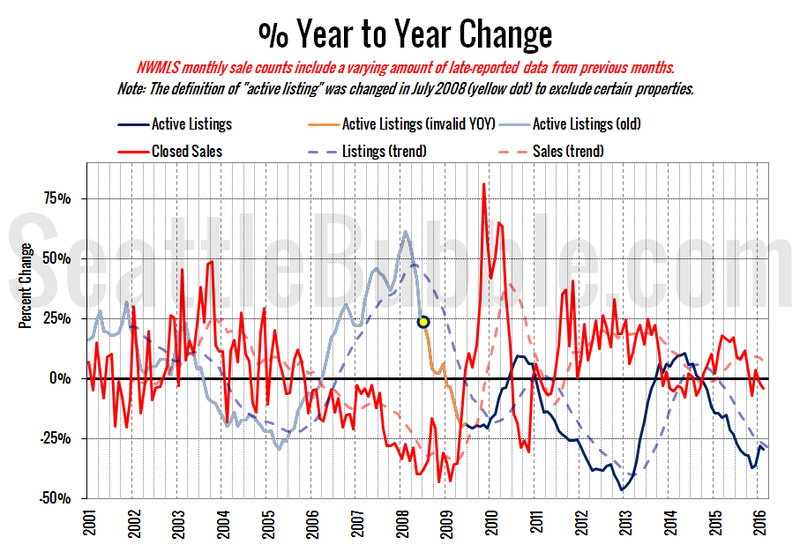 … is housing a lagging indicator?